The longest-serving Republican senator in U.S. history announced this week that he will finally, finally, finally, finally, finally, finally, finally retire. That’s seven “finallys” — one for each of the consecutive six-year terms Sen. Orrin Hatch, R-Utah, served. He began his occupancy in 1976, when all phones were dumb, the 5.25-inch floppy disk was cutting-edge, the very first Apple computer went on sale for $666.66, the Concorde was flying high, O.J. Simpson was a hero, Blake Shelton was a newborn, the first MRI was still a blueprint, and I was a gap-toothed first-grader wearing corduroy bell-bottoms crushing on Davy Jones. But that word doesn’t mean what Beltway barnacles think it means. Merriam-Webster defines a “statesman” as a “wise, skillful, and respected political leader.” Earning the approbation of other office-clinging politicians doesn’t make you a “respected political leader.” It makes you an echo-chamber chump. Wise? Skillful? Hatch was a Big Government business-as-usual dealmaker. His wisdom was of the wet-finger-in-the-wind variety, claiming a Reagan conservative mantle during election cycles and then throwing constitutional conservatives under the bus once comfortably back in his well-worn Senate committee seats. 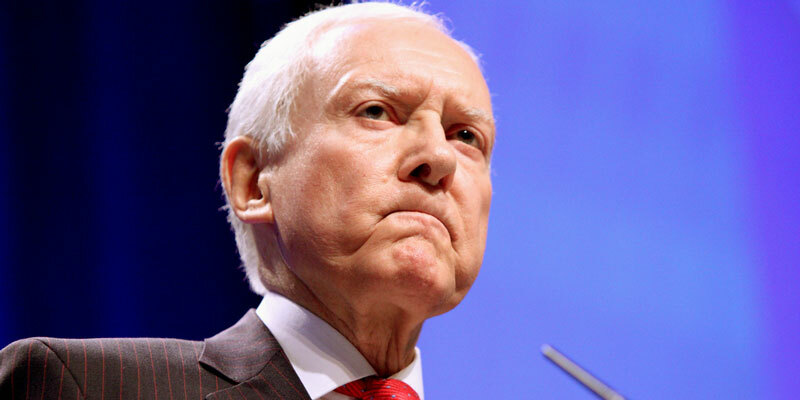 Hatch joined with his old pal Teddy Kennedy to create the $6 billion national service boondoggle and the $8 billion-a-year CHIP health insurance entitlement. He preached about the “rule of law,” but was an original sponsor of the open-borders DREAM Act illegal alien student bailout, and, despite claiming to oppose it, he voted to fully fund the unconstitutional Obama amnesty during the lame-duck session. He crusaded for “fiscal conservatism,” yet voted for massive Wall Street bailouts, 16 debt ceiling increases totaling $7.5 trillion, and scores of earmarks totaling hundreds of millions of dollars for porky projects. He ends his four-decade reign as the Senate’s top recipient of lobbyist cash. And for the past two years, Team Hatch allies have spearheaded a multimillion-dollar fundraising campaign, squeezing donations from corporate donors and pharma and tech lobbyists to subsidize a “Hatch Foundation” and “Hatch Center” to commemorate the Hatch legacy. “Statesman” isn’t a title earned by mere length of service. It’s not a cheap status conferred like an AARP card or IHOP senior discount. A politician who notches decades of frequent flyer miles back and forth between Washington and his “home” state, enjoying the endless perks of incumbency, does not acquire statesmanship by perpetual re-election and political self-aggrandizement. The idea of amassing $4 million to $6 million campaign war chests, as Hatch did the past two election cycles, is antithetical to the ideal of statesmanship. In the days of Cincinnatus and George Washington, self-sacrifice and civic virtue marked true statesmen. Affability, which Hatch is credited with possessing by his backroom Democrat chums, was no substitute for the humility exhibited by statesmen who volunteered to relinquish power at the very height of it — not in its waning twilight. So: Call Hatch a clock-puncher. Time-bider. Log-roller. Deal-cutter. Back-slapper. Call him most anything else now that he’s finally, finally, finally, finally, finally, finally, finally called it a day.